NO STATEMENT from the Federal Reserve is complete without a promise to make decisions based on the data. In each of the past two years, a souring outlook for the world economy prompted the Fed to delay interest-rate rises. And quite right, too. 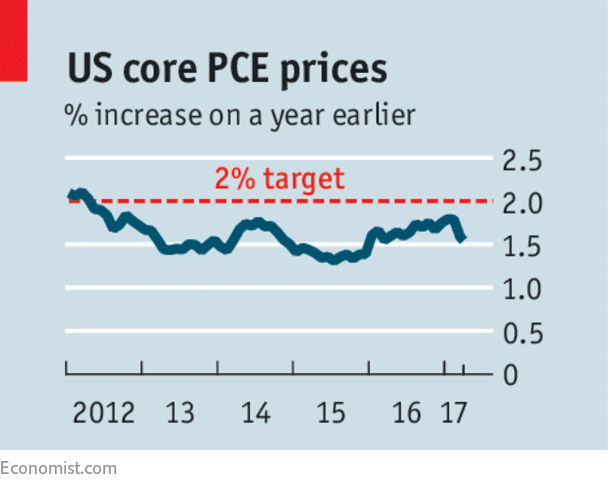 Yet if the Fed raises rates on June 14th in the face of low inflation, as it has strongly hinted, it would bring into question its commitment both to the data and also to its 2% inflation target. The central bank has raised rates three times since December 2015 (the latest rise came in March). It is good that monetary policy is a little tighter than it was back then. The unemployment rate, at 4.3%, is lower than at any time since early 2001. A broad range of earnings data show a modest pickup in wage growth. The Fed is right to think that it is better to slow the economy gradually than be forced to bring it to a screeching halt later, if wage and price rises get out of hand. The rate increases to date have been reasonable insurance against an inflationary surge. But no such surge has yet struck. Unexpectedly low inflation in both March and April has left consumer prices no higher than they were in January. According to the Fed’s preferred index, core inflation—that is, excluding volatile food and energy prices—has fallen to 1.5%, down from 1.8% earlier this year. It is now well below the 2% target. Nor does a surge seem imminent. For a while, Donald Trump’s promises to cut taxes and spend freely on infrastructure made higher rates appear all the wiser. But fiscal stimulus looks less likely by the week. Tax cuts are stuck in the legislative queue behind health-care reform, and Mr Trump’s administration has tied itself in knots over whether it will increase the deficit. Meanwhile, the current “infrastructure week” in Washington may generate more headlines than proper plans. Even so, the Fed is expected to go ahead and raise rates this month. The markets think there is a 90% probability of an increase of 25 basis points (hundredths of a percentage point). It is possible that more inflation is coming. An economy that is stimulated will eventually overheat. The central bank may believe that low unemployment is about to cause inflation. But the truth is that nobody is sure how far unemployment can fall before prices and wages soar. Not many years ago some rate-setters put this “natural” rate of unemployment at over 6%; the median rate-setter’s estimate is now 4.7%. The only way to find the labour market’s limits is to feel them out. Falling inflation and middling wage growth both suggest that these limits are some way off, for two possible reasons. First, higher wage growth could yet tempt more of the jobless to seek work (those who are not actively job-hunting do not count as unemployed). The proportion of 25- to 54-year-olds in employment is lower than before the recession, by an amount representing almost 2.4m people. By this measure, which fell in May, joblessness is worse in America than in France, where the overall unemployment rate stands at 9.5%. Second, even the moderate pickup in wage growth to date might encourage firms to invest more, lifting productivity out of the doldrums and dampening inflationary pressure. Jobs growth in America has already slowed from a monthly average of 187,000 in 2016 to 121,000 in the past three months. That is enough to reduce slack in the economy, but only just. Slowing it still further is needless so long as inflation remains quiescent. It makes still less sense when you consider the asymmetry of risks before the Fed. If tighter money tips the economy into recession, the central bank has only a little bit of room to cut rates before it hits zero. But if inflation rises, it can raise them as much as it likes. This asymmetry of risks extends to the Fed’s credibility. Inflation has been below 2% for 59 of the 63 months since the target was announced in January 2012. Continuing to undershoot the goal would cast more doubt on the central bank’s commitment to it than modest overshoots would. For too long, hawks have made excuses for the persistence of low inflation. The latest is to blame new contracts offering unlimited amounts of mobile data, as if cheaper telecommunications somehow should not count. The Fed should keep its promise to base its decisions on the data, and leave interest rates exactly where they are. Is Hosting the Olympics Good or Bad for a Nation’s Brand? With the International Olympic Committee (IOC) set to have chosen Paris over Los Angeles as the site for the 2024 Olympics, it is timely to ask: Is hosting the Olympics good for a nation’s brand, and do they provide a good financial return on investment? The Olympics in general does not always offer flattering views of a host country. Wall-to-wall media coverage can turn negative. For example, it was widely reported last year that Russia was engaged in a state-run athletic doping program involving as many as 30 sports and 1,000 athletes. The system included secretly swapping out urine samples through a hole in the wall at the 2014 Sochi Olympics. Many Russian athletes were barred from the 2016 Rio games. As a result, there have been calls for FIFA (Federation Internationale de Football Association) to strip Russia of its hosting privileges for the 2018 World Cup. “Sports fans and spectators have been deceived…. The desire to win medals superseded [Russia’s] collective moral and ethical compass and Olympic values of fair play,” noted Richard McLaren of the World Anti-Doping Agency, according to USA Today. How do scandals like this — or positive events, on the flip side — affect the world’s opinion of Russia or of any nation? Do international sporting events such as the Olympics have an effect on the “nation brand” of the host country? If so, the stakes are high and pay off go far beyond the realm of sports. How a country is perceived globally can affect its success in tourism, foreign trade and foreign direct investment, according to research by Wharton marketing professor David Reibstein. At the most recent Wharton Nation Branding Conference, which was hosted by Reibstein, panelists in the session “Nation Branding by International Sports” examined these issues. Moderator Ken Shropshire, the director of the Wharton Sports Business Initiative and a professor of legal studies and business ethics, said that while much has been said about how important sport is to bringing nations together (“I could give you overworked quotes from Mandela, Churchill, and others,”) there has been little discussion about what sport does for a nation’s Brand. He invited Stephen Greyser, a Harvard Business School emeritus professor of marketing and communications, to weigh in on whether events like the Olympics or the World Cup are “worth the effort” for a country. Greyser said they generally do enhance a country’s brand, but the economics are often more problematic. He also noted that the concept of nation-branding pervaded China’s handling of the 2008 Beijing games. “In China their goal was broad recognition as a leader on the global stage that transcended political power.” He said that China was largely successful, but that in terms of political reputation, the country was thrown into a negative light. He described how the choice of Beijing for the Olympics sparked international protests against China’s record on human rights, Tibet and other issues. “Advocates basically captured the Olympic flame, not literally, but figuratively,” he observed. Many of the protests occurred along the route for the Olympic torch, a route which in 2008 still extended around the world. In fact, said Greyser, it was as a direct result of the bad publicity that year that the ritual was changed to have the torch ceremony occur only in the host country. Planning and operations are a key factor in projecting a good image of the games, Greyser noted. TV coverage of the 2016 Rio Olympics often unintentionally revealed many empty seats. He suggested that the Rio planners could have partnered with a supermarket or department store chain to offer low-cost or free tickets for events anticipated to have low attendance. The Rio Games: Broken Promises? Did the most recent Olympics, the 2016 Rio games, have an effect on Brazil’s nation brand? International journalist Alex Cuadros, the author of the 2016 book Brazillionaires, pointed out that hosting the Olympics was “a really bad decision for Brazil” as was the 2014 World Cup. He described Rio as a city with a woefully inadequate infrastructure in which many residents live in favelas: informal settlements known for being plagued by poverty. The plan for the Olympics included building permanent new train and bus lines that would help working-class people commute and would integrate the favelas with the rest of the city. But “the reality of what happened with that money is very different from the ambition,” said Cuadros. He said the neighborhoods that benefitted from new transportation systems, such as Barra da Tijuca and Ipanema, were already among the wealthiest. He stated that some of the individuals profiting the most from the Olympics were “well-connected real estate tycoons” whose projects included building a golf course on what had been environmentally-protected land. He went on to cite, by comparison, recent Olympic games that were marked by bizarre, even tragic events that made headlines. In Beijing at the city’s ancient Drum Tower, the father-in-law of the U.S. Olympic men’s volleyball coach was stabbed to death by a Chinese man who then jumped to his own death. At the London 2012 games, a British spectator shouted insults at Jamaican sprinter Usain Bolt and threw a beer bottle onto the track moments before the 100-meter final. And at the Athens 2004 games, a defrocked Irish priest rushed onto the marathon road and pushed Brazilian contender. And at some Olympic games, simple disorganization tainted the experience. Milman, who worked as a volunteer for the 1992 Barcelona Olympics, recalled waiting on line for hours for the required uniform, only to be told there weren’t any left. Another example of poor planning was put forth by Greyser, who described how for the 2004 Athens games, facilities were so far behind schedule that people joked Beijing was already making better progress toward 2008. “So what happened in Brazil during the games? The audience was too noisy: oh, shame on us,” Milman said sardonically. In spite of the nation’s political and economic crises, he said, Brazil had delivered a successful Olympics. The Paralympics: More Olympian than the Olympics? Milman also spoke about the Paralympics, which took place in Rio in September. Though a veteran sports journalist, he had never before covered the event, and it left an impression on him. “Think about Usain Bolt or Michael Phelps. They are designed to win: the bones, the muscles … everything. But think of an armless archer, for instance.” Or, he said, consider a blind soccer player relying only on his hearing and a small ring attached to the ball. “This is something fantastic.” He commented that at the core of the Paralympics is the capacity to adapt, which he said is a very important asset — if not the most important one — for individuals, companies and nations. He noted that two million tickets were sold for the Rio Paralympics. “Not as big as the Olympics five million — but it’s something very impressive.” He added that Google searches for the Paralympic games were higher for the Rio event than for any previous Paralympics. “I think people are realizing that Paralympics are not any more a by-product of the Olympics, but something with a lot of potential, with a very important message, and even more connected to the Olympic spirit than the Olympics itself,” he said. The Dow Jones Industrial Average is trading at all-time highs. The Nasdaq and the S&P 500 are similar. 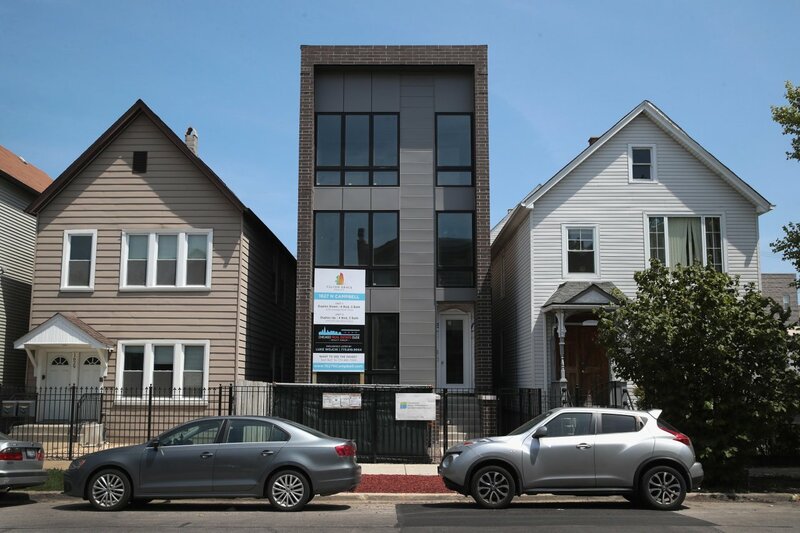 This begs many questions. Are the high stock prices supported by fundamentals or have they been levitated with "easy money"? Bubbles always collapse and prices crash. Stock indices are too high, but are they in historical bubble territory? What about gold, silver, real estate and bonds? Are they also in bubbles? Quick Conclusions: Easy money and massive debts, thanks to the Federal Reserve and fractional reserve banking, have created overvaluations and bubble like prices in stocks, bonds and real estate. Gold and silver prices have suffered. Expect reversals! Consider a century of the DJIA (Dow Jones Industrial Average) on a log scale. The index has exponentially increased. But during the past century, the purchasing power of the U.S. dollar has declined 97% to 99%, which accounts for much of the increase in the DJIA. The Nasdaq is similar. 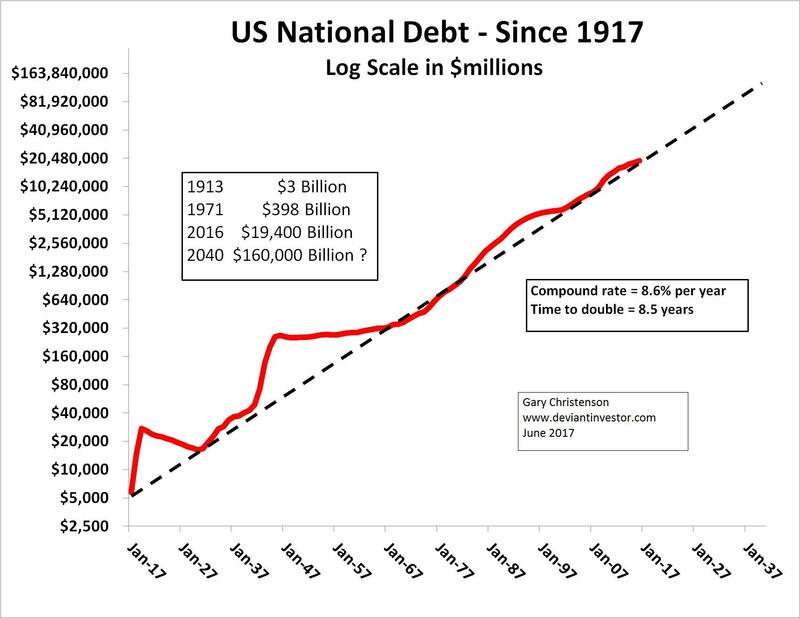 National debt increases, commercial and central banks pump dollars into the economy, the excess dollars devalue all existing dollars, and prices rise. Further, many of the created dollars since 2008 have been invested into the stock and bond markets, propelling them higher. Rising debt and minimal interest rates encourage real estate speculation, stock buybacks, bond rallies, margin loans and unsustainable prices. Mortgage debt, corporate debt, margin debt and consumer debt have again reached excessive levels. Debt has increased at roughly 9% per year for a century. Thought experiment: Which presidents, congresspersons, lobbyists, Deep State supporters, military contractors and entitlement recipients want spending and debt reduced? Spending and debt will increase until they can't, which might be years into the future. 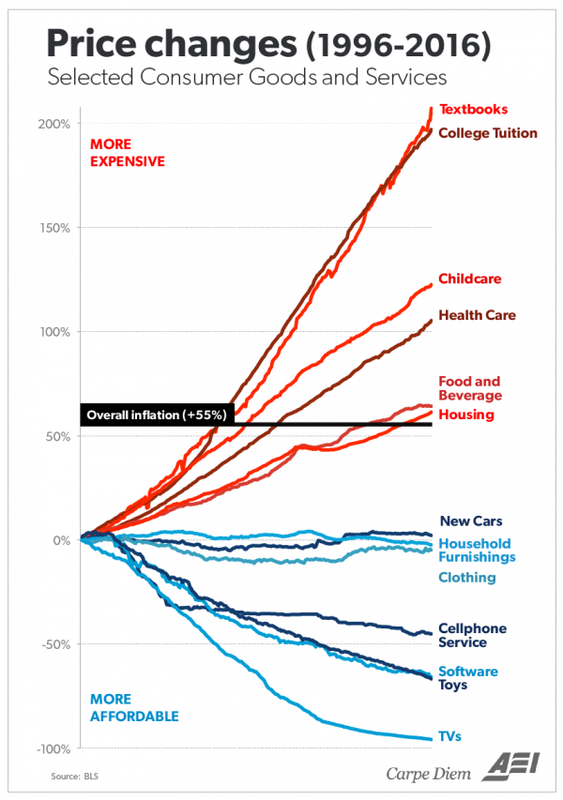 Expect more spending and debt increases, which will further devalue the dollar and cause price rises in stocks, bonds, commodities, medical care, consumer goods, college tuition, gold, silver and more. Some will rapidly increase while others languish. "Easy money" has been a large contributor to higher prices. Yes, technology, productivity and genius have been important in some cases, but central banks desire and instigate continual devaluation of their currencies. Higher prices for stocks and bond result from "printing money." Bubbles occur when prices spike higher independent of fundamentals and relationships to other prices. Look at the rate of change indicator (ROC) for the Nasdaq 100 Index. This indicator calculates a comparison of prices versus 12 months previously. It is one of many "bubble" indicators. The maximum ROC for the Nasdaq 2000 bubble was 121. Current ROC is 33. The Nasdaq ROC is historically low compared to the bubble of 2000, as the current rise in stock valuations has been more gradual. 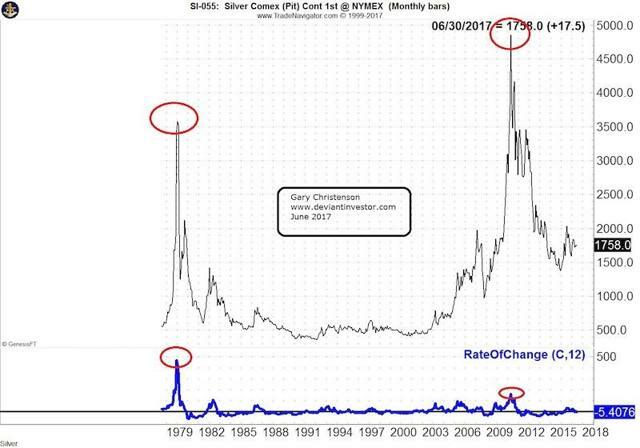 The maximum ROC for silver in the 1980 bubble was 468. The maximum ROC for silver in 2011 was 161, far below the bubble territory of 1980. 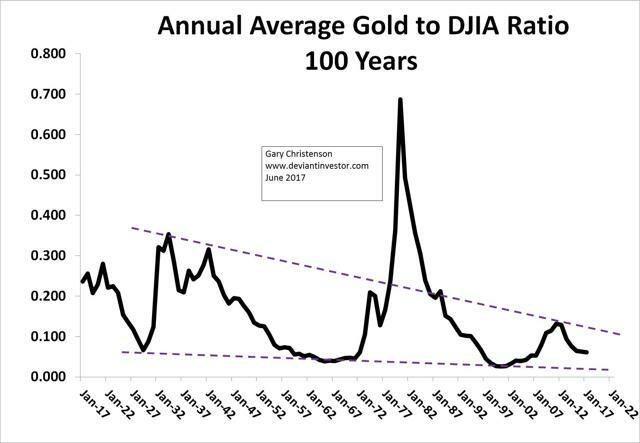 Silver and gold are clearly not in bubble territory in June 2017 but look very undervalued historically. What About Gold Compared to the DJIA? Both gold and the Dow have risen exponentially for many decades, as the dollar has been devalued. The ratio of gold to the DOW shows the relative strength of both. 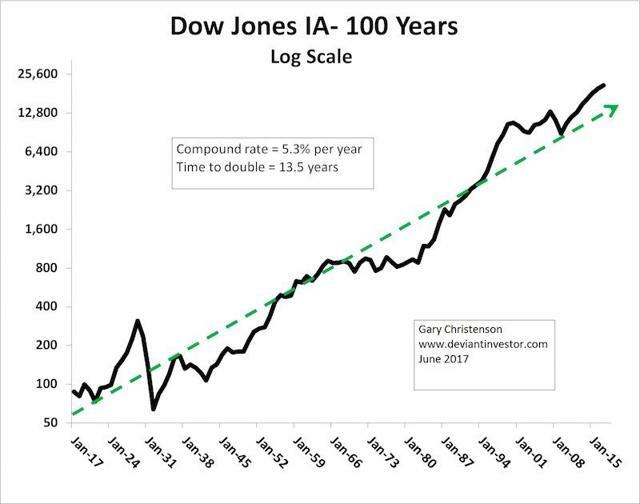 Gold prices are relatively low compared to the DJIA, based on a century of data. The ratio is currently about 0.06. 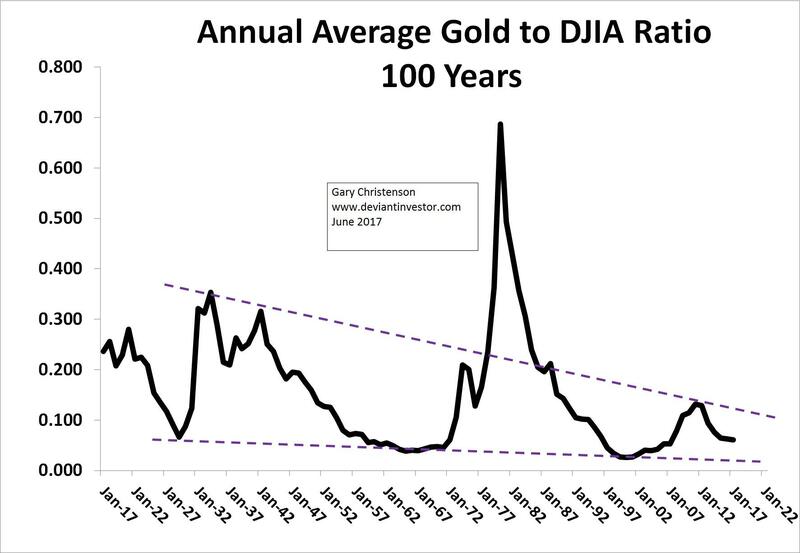 The next gold spike upward could easily push the ratio 5-10 times higher, mostly due to higher gold prices and partially due to a Dow correction. Since 1971, according to the above graph, the GSCI (Goldman Sachs Commodity Index) ratio to the S&P 500 Index has averaged about 4.1. It currently stands at about 1, similar to levels at gold lows in 1971 and 1999. This ratio suggests that the next crisis - war, financial, credit, derivatives, whatever - could elevate the ratio from 1 to 5 or perhaps 10. A few possible crises come to mind: Canadian housing, Italian banks, U.S. debt ceiling, war with North Korea, war with Iran, Chinese credit collapse, U.S. economic downturn, gold delivery failure, China announces the truth about their gold holdings, and many more. Prices can fall without an external stimulus. They can rise too high and be unsustainable. Prices on the Nasdaq, DOW and S&P, in spite of High Frequency Trading and central bank levitation efforts, may fall for no particular reason or for many reasons. "... the market is in the process of tracing out the blowoff finale of the third speculative financial bubble since 2000." "... our outlook does remain hard-negative..."
"... I continue to have every expectation for a 50-60% loss in the S&P 500 over the completion of the current market cycle." Stocks and debt have increased significantly for over a century. Expect the debt increases to continue... until they can't, whenever that will occur. "Easy money" has levitated stocks, bonds and real estate to near-bubble levels. 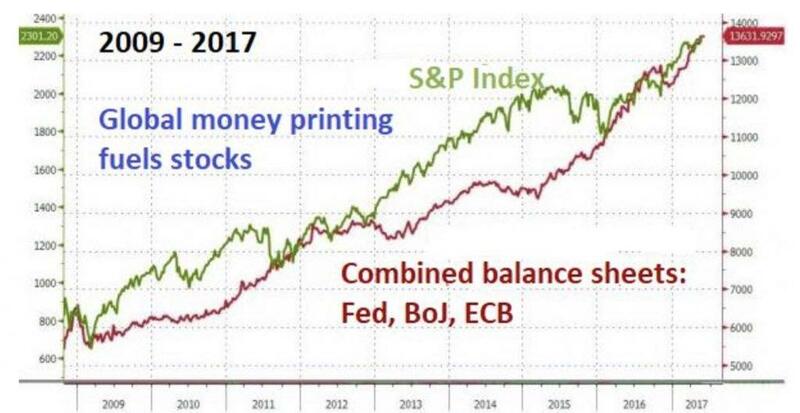 Global central banks have shoveled currency into the markets, and several have aggressively purchased stocks (Japanese and Swiss central banks, U.S. PPT?) to support stock markets. We do not believe these practices are sustainable over the long run. 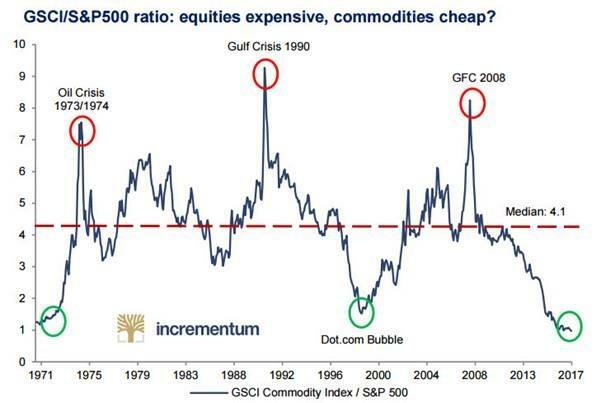 Commodities are currently priced low compared to stocks. Expect that relationship to reverse in the next several years. Read "Silver and NASDAQ Strength Will Reverse." 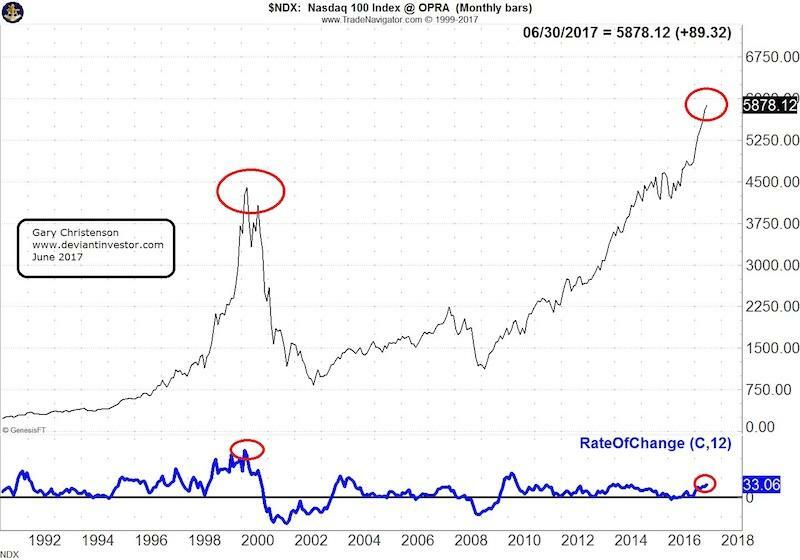 Rate of Change (12 months) indicators have exceeded 100 in historical bubbles, such as 1980 silver, 2000 Nasdaq and 2007 Shanghai. Based on the ROC indicator, neither the Nasdaq, S&P 500, DJIA, gold nor silver are currently in historical bubbles. Stocks may not be in historically valued bubbles when looking at the ROC, but they are too high by dozens of measures, including P/E ratio and margin levels. Gold and silver are priced low by comparison with the above stock indices. Expect reversals and much higher gold and silver prices. Do your own due diligence, but in my opinion, gold and silver and shares in the companies that mine them should rally strongly over the next several years, and most stocks should correct from their lofty prices. A major crisis, of which many are possible, will accelerate stock market declines (not including gold and silver stocks), gold and silver rallies and central bank intervention to "support" the stock markets. Central bank "money printing" and resulting inflation will create other disasters. There are reasons to worry about the strength of U.S. consumer spending. Debt isn’t one of them. The Federal Reserve on Thursday released its detailed rundown of U.S. financial accounts. Its measure of household debt reached a record $14.6 trillion in the first quarter, about $500 billion more than in the third quarter of 2008, when the financial crisis got going, and $1.5 trillion above the postcrisis low. 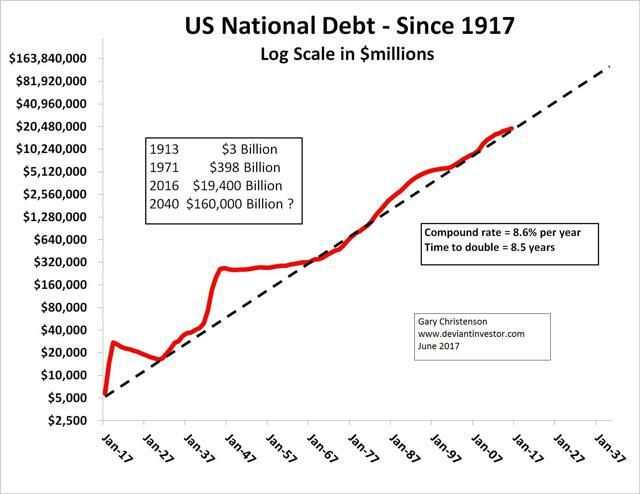 It is the kind of figure that, taken out of context, could lead you to bemoan how Americans are lining up at the debt trough again. But context is important. As a group, U.S. households made a lot more in the first quarter, and were worth a lot more, than when the crisis struck. Their after-tax income came to $14.3 trillion, at an annual rate, versus $11 trillion in the third quarter of 2008. Their net worth was $94.8 trillion in the third quarter, versus $60.4 trillion. As a result of the gains, households’ debt-to-income and debt-to-asset ratios both ticked postcrisis lows. Mortgages are the main cause of decline. A drop in homeownership, a rise in defaults, more stringent lending terms and a weak housing market pushed mortgage debt levels sharply lower, and even now they are significantly below their 2008 peak. Some types of debt have filled the gap to an extent. Notably, separate data from the Federal Reserve Bank of New York show student loan levels are up sharply. That is a reflection not just of rising tuitions, but an increase in the number of people pursuing postsecondary and graduate educations. On the other hand, credit-card debt remains low. The Fed reported on Wednesday that revolving credit outstanding (the bulk of which comes from credit cards) rose a scant 0.2% in April from March. That amounted to 7% of after-tax income versus 9.3% at the start of 2008 and 8.6% at the start of 2000. It counts as one of the clearest signs of how much more averse people are to taking on debt than they were in the precrisis days. They also seem pretty averse to boosting their spending, and there are reasons for that other than debt. It matters that a bigger share of people rent homes than before the crisis and that rising rents have been cutting into their ability to spend on other things. It matters that some things that once counted as discretionary purchases, like internet access and mobile telephone plans, are now pretty much essential to many Americans. It matters that the gains in wealth have mostly flowed to richer households, which have a lower propensity to boost spending. And it matters that despite the gains in employment, wages are going up slowly. People are being more careful about debt, and maybe they are being more careful for a reason.